Will Sanders Stand As A Green To Stop Clinton? By doing this well, as a proudly declared “democratic socialist” who on the stump has been denouncing the corruption of both the US political and economic systems, and as a candidate who has refused to take corporate money or money from big, powerful donors, instead successfully funding his campaign with only small two and three-digit donations from his supporters, Sanders has exposed not just his opponent, Hillary Clinton, but the entire Democratic Party leadership and most of its elected officials as nothing but hired corporate tools posing as progressive advocates of the people. But now Sanders faces a truly momentous choice. Defeated by the combined assault of a pro-corporate mass media and by the machinations of the Democratic Party leadership — machinations both long-established with the intent of defeating upstarts and outsiders, like front-loading conservative southern states in the primary schedule, and current, like scheduling only a few early candidate debates and then slotting them at times (like opposite the Super Bowl) when few would be watching them — Sanders knows that barring some major surprise like a federal indictment of Clinton, a market collapse, or perhaps a leak of the transcripts of Clinton’s highly-paid but still secret speeches to some of the nation’s biggest banks, he is not going to win the Democratic nomination. So does he, after spending months hammering home the reality that Clinton is the bought-and-paid candidate of the the banks, the arms industry, the oil industry and the medical-industrial complex, and after enduring endless lies about his own record spouted by Clinton and her surrogates, go ahead and endorse her as the party’s standard bearer for the general election? Does he walk away and return quietly to Vermont? Or does he instead continue to fight for his “political revolution” by another route? Just shutting up and going home, with no endorsement for Clinton, would be almost as bad, leaving his movement leaderless and thoroughly demoralized, and he’d still be besieged by journalists seeking to have him either diss or endorse Clinton. The third option Sanders has though, is to continue his run for president, but not as a Democrat. And that option could be explosive and even revolutionary this election year, depending on how he did it. Most states have deadlines for candidates seeking to get a ballot line as an independent candidate that are earlier than the Democratic convention in July, so running as an independent would be impossible. And a write-in campaign would be even more hopeless. But there is another option: Running as the presidential nominee of the Green Party, which already has a ballot line on 25 states and which doesn’t hold its nominating convention until August, after both the Democratic and the Republican conventions are over. 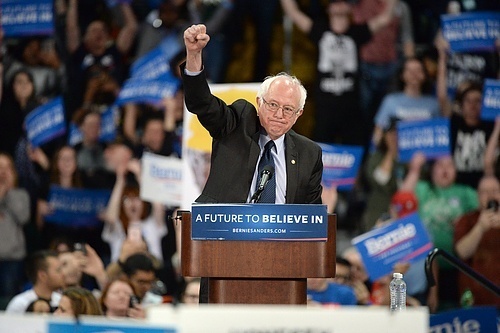 Will Sanders seize this opportunity to continue the fight? If he is serious about inspiring a political revolution, he must. He has said he does not want to be a spoiler “like Ralph Nader” and help elect Donald Trump or some other Republican. But would that be the result of a three-way race with Sanders running as a Green? Not necessarily. In the first place, the claim that votes for Nader led to George W. Bush’s 2000 victory over Al Gore is bogus. Gore lost because he embarrassingly failed to win his own state of Tennessee. As well, it is clear that it was a corrupt Republican Supreme Court that by a 5-4 vote halted the count in Florida that handed that state’s electoral votes to Bush. It has been shown that continued counting and challenges to improperly rejected ballots would clearly have given Florida to Gore. More importantly, 2016 is not 2000. The public this year is clearly sick of the two major parties, and disgusted by the undemocratic nature of the primaries. Incredibly, both Trump and Clinton, the likely winners of those primaries, represent the two most unpopular and disliked candidates in memory, with some 65 percent of Americans saying they dislike Trump and another 56 percent saying they dislike Clinton. Indeed, Clinton, not favored by almost half of Democrats, is so disliked outside the Democratic Party that there’s a strong likelihood — and a fear even among Democratic leaders — that she could lose to Trump or another Republican nominee all by herself, with or without a Sanders endorsement. Meanwhile, the most liked candidate this year continues to be Sanders, whose negative rating is just 36 percent — probably all of them Republicans — and who continues to poll better against all possible Republican candidates than does Clinton. With numbers like that Sanders, if he continued to build his movement and continued to bring in new voters as he has demonstrably done in the primaries, could even contemplate winning such a general election race. He has also demonstrated his ability to attract tens of millions of dollars a month in online contributions. Running in a three-way race, he’d surely collect even more money, making him fully competitive with the two widely-loathed big-party candidates. As the Green’s presidential candidate, Sanders would have the opportunity, even if he were to lose, to catapult the Green Party, for decades stuck in limbo in the low single digits as simply a protest-vote option, into major-party status as the party of the 99% — the poor, working and progressive people of all races. That’s a standing that would not go away in subsequent elections, but that instead could be built upon — especially with both major parties currently in danger of fragmenting. Given Sanders’ already proven popularity, it would be impossible for the corporate media to deny him a lectern at any general election debates, as was always done to Green Party candidates and independents like Nader in the past. Sanders and his ardent supporters, in other words, have a unique historic opportunity to shatter the asphyxiating two-party duopoly of two pro-corporate parties that has been the Bermuda Triangle of progressive politics for over a century. Will he give up on the self-defeating, nonsensical notion of backing Hillary Clinton if she wins the Democratic Party’s nomination for president? If he does, despite being clearly the most progressive candidate to make a serious run for the presidency since Eugene Debs in 1920 (when he garnered 3.4 percent of the vote running from a prison cell), Sanders will at best be consigned to a brief, dismissive footnote in future histories of the United States. If he runs in the general election as a Green, he has a chance to write a whole new chapter in those history books. If Bernie Sanders is reluctant to make the jump to running as a Green, he needs to be pushed by his supporters. He needs to be shown that it can be done, and that his would not be a quixotic campaign, but rather a serious effort to win the White House. How can that pushing be done? Well, think about it a minute. By the time this primary season ends in early June, Over nine million people, and maybe more, will have cast votes for Sanders. Many many more who support him passionately were denied the right to vote for him by restrictive primary rules in states like New York, New Jersey, Pennsylvania and elsewhere, rules that limited voting in Democratic primaries to people registered as Democrats (in NY you had to make that decision back in October, 2015 before Sanders was even being considered a serious candidate!). In fact, where the primaries have been open to independent voters, Sanders has usually won. Even last Tuesday, the four primaries that Sanders lost, in Pennsylvania, Maryland, Delaware and Connecticut, were closed, but in Rhode Island, which was open to independents, Sanders won by 10 percent, a crucial difference not mentioned in most corporate news reports). Obviously in the general election, independents will be voting. Imagine if even a fraction of those millions who back Sanders — his voters and those who were barred from voting for him — were to descend on Philadelphia for the July Democratic convention, which will be held on July 25-28 in, of all places, the Wells Fargo Bank Center (funded and named by one of those notorious too-big-to-fail banks that have been Hillary Clinton’s faves). Imagine those Bernie backers filling the streets of this city where the nation was founded, armed with signs saying “No Hillary endorsement!” and “Go Green Bernie!” And remember, inside that aptly named convention center there will also be hundreds of elected Sanders delegates, who would be demanding the same thing of him. How could Bernie Sanders, a 74-year-old activist veteran of so many popular movements over the years, refuse such a rousing call to action? Is What Ken Livingstone Said Really Anti-Semitic? Following the interview a Labour MP called John Mann confronted Livingstone, calling him a ‘Nazi apologist’. After that Livingstone was suspended from the British Labour Party with approval of Jeremy Corbyn, the under-siege leftist leader of the party. Apparently what the former Mayor of London had to say about the Hitler-Zionist pact is historically accurate and he gave his interview to defend Labour MP, Naz Shah who was also suspended from the party, also charged with anti-semitism for criticisng Israel. She’s a deep critic of Israel and its policies. Her remarks were over-the-top but she’s not antisemitic. I’ve been in the Labour party for 47 years; I’ve never heard anyone say anything antisemitic. I’ve heard a lot of criticism of the state of Israel and its abuse of Palestinians but I’ve never heard anyone say anything antisemitic. The simple fact in all of this is that Naz made these comments at a time when there was another brutal Israeli attack on the Palestinians; and there’s one stark fact that virtually no one in the British media ever reports, in almost all these conflicts the death toll is usually between 60 and 100 Palestinians killed for every Israeli. Now, any other country doing that would be accused of war crimes but it’s like we have a double standard about the policies of the Israeli government. Was this a genuine bout of anti-semitism or one or both of two other things: a) a convenient stick which the Blairite wing can use to beat Corbyn and edge him closer to his ouster as leader, or (b) one more effort to label any and all criticism of Israel as anti-semitic (the real target being the BDS movement, of course)? It now looks as if America will have a lunatic and a war-monger vying for the world’s most powerful political job this November. We have just learned that the British government, acting on behalf of the Police Service of Northern Ireland (“PSNI”) and the office of the Director of Public Prosecution (“DPP”) in Belfast, have served a subpoena on Boston College seeking personal interviews given by Dr. Anthony McIntyre to the Belfast Project based at Boston College, Massachusetts. The subpoena has been served under the terms of the Mutual Legal Assistance Treaty (“MLAT”) and the UK statute, the Crime International Cooperation Act 2003 (“CICA”). Dr. McIntyre, who was lead IRA researcher for the Belfast project, gave a series of interviews himself which were conducted by a guest interviewer. Dr McIntyre has made no secret of this fact. He has now engaged leading Belfast human rights lawyer Kevin Winters of KRW Law LLP, to resist these efforts to raid his personal memoirs. The subpoena request provides no details of specific charge, investigation or offence of which Dr. McIntyre is accused, no names of alleged victims, no dates, no places. Instead the originators of this shoddy document mention matters which are so overbroad, that literally anyone alive during the Troubles in Northern Ireland could be accused of some association with them. We do know, in particular, that this request does not have anything to do with the disappearance and murder of Jean McConville, which was the event that motivated this PSNI trawl five years ago. Both the US District Court and the US Court of Appeals for the First Circuit clearly deemed Dr. McIntyre’s interviews not to be relevant to the Jean McConville investigation. Under the terms of the MLAT and CICA, which the authors of the subpoena claim as their legal basis for this action, requests for assistance from a foreign power may only be made where (a) there are reasonable grounds for suspecting that an offence has been committed, and (b) proceedings have been instituted, or an offence is being investigated. There are no proceedings in being for any offences relating to Dr. McIntyre and there is no reason to believe that any current or historical offence is being investigated. This action by the DPP and PSNI is simply a fishing expedition, which is prohibited by international law. Boston College has been ordered to appear at the John Joseph Moakley Courthouse in Boston at 10 a.m. on May 6th to deliver Dr. McIntyre’s interviews. The DPP and PSNI have requested, and the Obama Department of Justice has agreed, to demand that Boston College keep these legal proceedings secret, away from the prying eyes of the international press. This Press Release puts paid to those nefarious efforts. The gag notice means that the attempts of the British authorities once again to stifle academic research into the Troubles of Northern Ireland, an essential part of the peace process, was to be conducted entirely in secret like some modern day Star Chamber. The use of secret courts offends every principle of legal fairness and openness inherent in the American legal system, as well as best international human rights practices, and we call on the media, in particular, whose First Amendment rights to cover such events are being undermined, to protest by turning up at the courthouse at 10:00 a.m. on May 6, 2016. Secret courts and censored hearings smack of totalitarianism and they offend the public’s right to know. The British authorities, the PSNI and the DPP have had more than ample time and opportunity to subpoena Dr.McIntyre’s materials before this. This begs the question, why are the authorities doing this now? What is the real reason for this subpoena? One explanation which leaps to mind is that this is an act of simple revenge, motivated by anger at the fact that the resistance to the subpoenas led by Dr. McIntyre embarrassed the prosecutorial authorities in Belfast, which have so far failed to bring any prosecution beyond the preliminary inquiry stage, never mind a successful conclusion to their well-publicized efforts in raiding and destroying a valuable Oral History archive. This is pay back, in other words. Abuse of process is the only term to describe the treatment of Ivor Bell, who is the only individual charged following the receipt by the PSNI of Boston College materials. Mr. Bell has vigorously protested his innocence of any charges, and his case has not progressed past the preliminary inquiry stage after years of hearings. Abuse of process is the only term to describe this latest move against Dr. McIntyre by the DPP and Obama’s DoJ. We therefore call on the Irish government not to co-operate with the British authorities should any effort be made to extradite Dr. McIntyre from his home in Drogheda to Belfast for the purposes of yet another futile and inordinately expensive “show trial.” We have sent a copy of this statement to the outgoing Taoiseach, Mr Enda Kenny and to the Fianna Fail leader, Micheal Martin TD. We also call upon all decent-minded people in the US, politicians, lawyers, civil libertarians and members of the public to protest this disgraceful action by the Department of Justice. We call upon progressive candidates seeking nomination for the US Presidency to make their views clear on this matter. Accordingly we appeal firstly to the Trustees of Boston College to support any legal effort to resist this subpoena. This is a matter which could adversely affect everyone teaching on Boston College’s campus. We would like to extend that appeal to the rest of American academe and ask the researchers and teachers of Higher Education in America to recognise the seriousness of this threat to researchers everywhere by making your opposition to this subpoena loud and clear. This is a matter which directly affects academic freedom in America. This is not a time for silence or acquiescence.